Thanking Jamie for getting in touch regarding our shared family heritage. Jamie is the Third Cousin-once Removed of Denis Madigan Stanton. You can see below how the trees tie when they reach Margaret Stanton and John Brannan. Both families of Irish origin shared the same fate when the Great Famine took hold of Ireland in the late 1840s. Edinburgh was a destination for both these lines and it was in the darkest area of the City where they landed, old Grassmarket and Cowgate. The area was just bursting with immigrants from Ireland and also Italy who were having their own home grown crisis also. Both fiercely Catholic Countries and whose lives were entwined in the Old St. Patrick’s Church where they all worshipped. The Brannan family were living in County Rosscommon before the famine hit. 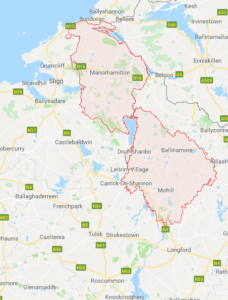 A neighbouring County of County Mayo where the Stanton’s had their roots. John Brannan was born on 29th October 1858 at 16 Leith Wynd in Edinburgh. 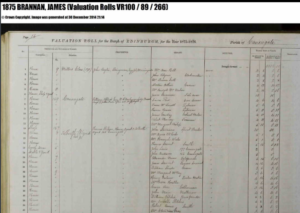 In 1861 the census information show us that the family residence was 25 Leith Wynd so we must assume that Margaret gave birth at a neighbour’s home who would have probably been the local ‘midwife’. Very common in those days. John’s father, James Brannan was a fish merchant and with them at this time they had the start of their ever growing family Mary Ann (born 1854), John born 1858 and Ellen (Born 1860). They also had a domestic servant Ann Rynn age 16 who resided with the family. So this suggests the family were doing alright with the fish business to be able to afford live-in help. Ann was also born in Ireland. 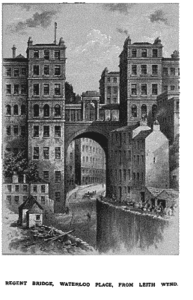 Leith Wynd is an address that is now gone, lost in the passing of time, but it ran from the steep northern slopes towards Calton Hill from the old Nether Bow Gate. Part of the Canongate district and an ancient part of the City and as the name suggests it ran from the High Street area down to Leith and beyond. By 1871 the Brannan family now consisted of James and Mary with children John, James, Winifred, Jane and Helen who was only 6 months. Interestingly they had a nurse residing with them called Margaret Lockhart. She was 67 years old and at this point of the story we are unsure of her relationship with the family. James senior was now described as a Fish Curer and young John was his assistant. By the 1881 Census the family had moved to 6 Miller’s Close, a close off the High Street, sometimes called the Back of the Canongate. James tells us he was born in County Rosscommon, Ireland. Mary McLaughlin tells us she was born in Leitrim in Ireland, which is in the situated in the North of Ireland. Son John has now left the family but brother James is now the Fish Curer’s Assistant. Joined by a sister Catherine age 9. 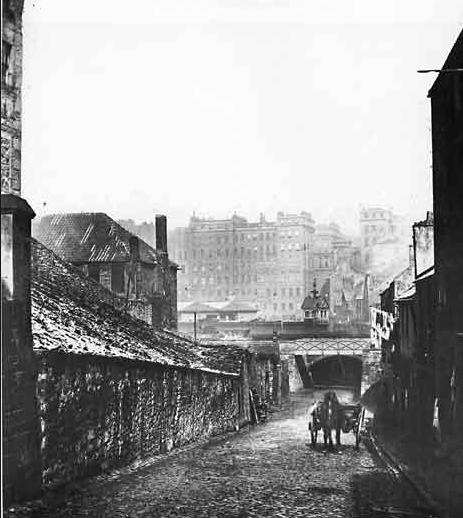 James Senior died on 6th July 1886 at 9 Miller’s Close, Canongate, Edinburgh. Margaret McLauglin died on 26th October 1882 at 6 Miller’s Close, Canongate, Edinburgh. Jamie’s line was John Brannan. John married Margaret Stanton in St. Patrick’s Church, Cowgate on 20th January 1879. Their marriage was very productive and they had children nearly every year. JAMES EDWARD BRANNAN born 1881-1918 . James died in the 1st World War in France and Flanders on 18th August 1918. 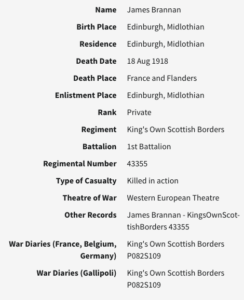 He was a Private in the Scots Own Scottish Borderers 1st Batallion and died in Action in France after having seen action in Germany and Gallopoli. EDWARD STANTON BRANNAN born 1886 This is Jamie’s line. Edward married Jane Anderson Thomson. Their son James Thomson Brannan is Jamie’s grandfather. MARGARET BRANNAN born 1888-1965 . Margaret married Patrick McCabe. They had a large family who resided also at the Southside of the City around Richmond Street.